The new Hyundai i10 now has a variant to suit every budget, from a plain utility car to a gizmo-laden one, including automatics. It was in 2007 that the ‘i Series’ was launched with the i10 (and Shahrukh Khan remains Hyundai’s brand ambassador). The debutant car was named the car of the year in 2008. Now the 2010 model i10 is looking to bag a few awards. 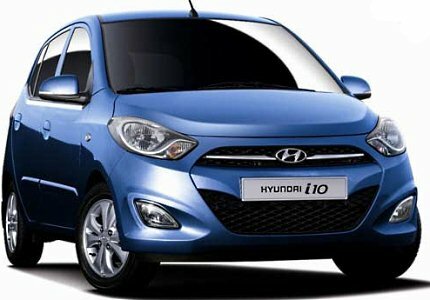 The new face-lifted Hyundai i10 looks more aggressive and sporty than its older version. The i10 sports a new look on the outside with a chrome radiator grille, bubble wraparound headlights, chrome-rimmed fog lamps, a wider air dam with a honeycomb grille and a newly designed front bumper. The outside rear view mirrors also incorporate turn indicators – a feature uncommon to cars in its segment. At the rear, it has elongated taillamps and the new bumper with reflector inserts also incorporates parking sensors – another segment first. The cabin of the Hyundai i10 now has steering-mounted audio controls and Bluetooth connectivity. The music system has been equipped with a USB port and AUX connection, and the instrument console lighting is now a vibrant blue instead of light green. Other features include a luxurious two-tone dashboard, faux aluminium casing for the audio system, a digital fuel meter and gear shift indicator. The gear shift indicator – another segment first – is an interesting addition, which advises the driver when to change up or down. The metal and chrome touches give the car a premium quality feel. The customary range of warning lights for various functions like seatbelt, oil levels, battery, power steering etc are all present to presage when something begins to go wrong. Head room is more than adequate at the front and back seats, but taller passengers might be squeezed for leg room at the rear if the front seats are pushed back. Hyundai claims its intelligent responsive technology (now called iRDE2) also improves performance and mileage. The 5-speed manual transmission with overdrive that comes standard across all variants is quick and responsive. However, a 4-speed automatic is also available on the i10 powered by the Kappa engine. The braking system is designed with ventilated discs in the front and self-adjusting drums in the rear. There are many segment firsts fitted into the i10’s top-end version, but these come at a price. The goodies and gizmos on offer will attract those who want more features in a hatchback of the i10’s size. And the base model will continue to appeal to those looking purely for value. It is the base variant of the Hyundai i10 that comes with a 1.1L, IRDE engine but it does not offer features like adjustable steering wheel, central locking, power windows, wheel covers, CD/MP3 player, fog lamps and body coloured bumpers. Present however are: engine immobilizer, driver and passenger-side ORVMs, tachometer, gear shift indicator, electronic fuel gauge, i-Relax front seats, i-Shift gear control, and A/C with heater. Along with the features present in the Dlite, the Era model also comes with a few additional features such as central locking, power windows (front) and body coloured bumpers, a chrome radiator grille, front door map pocket, deluxe floor console with power outlet, metal grain finish centre fascia, motor-driven electronic power steering and passenger vanity mirror. This variant comes with the new Kappa engine. It also carries few additional features like adjustable steering wheel and full wheel covers. Also present are turn indicators on the outside mirrors, body coloured outside mirrors, rear parcel tray, chrome finished inside door handles and power windows all around. The Magna is also available with the 1.1 litre engine. This variant of Hyundai i10 carries the same features that Hyundai i10 Magna offers, the only difference is that it comes with an automatic transmission. This variant of Hyundai i10 also carries 1.2l Kappa engine and the additional features it offers are CD/MP3 player, rear defogger, rear wash wipe, Body coloured waistline moulding, rear spoiler with HMSL, digital clock on audio display, door & tailgate ajar warning, driver seatbelt warning, intermittent front wiper & washer, AUX and USB ports, 2 DIN Radio+CD+MP3 audio and driver vanity mirror. This variant of Hyundai i10 carries the same feature that Hyundai i10 Sportz offers, the only difference is that it comes with automatic transmission. Small but premium additions are a chrome finish gear knob and leather wrapped steering wheel, gear knob and parking brake. The Asta variant features every single add-on possible, with the exception of the kitchen sink. Standard on this top-end variant are: front fog lamps, foldable key with keyless entry, seatbelt pre-tensioners, ABS, reverse parking sensor, dual airbags, impact-sensing auto door unlocking, electric sunroof (optional), ignition key reminder, battery saver, height adjustable driver’s seat, tilt steering, Bluetooth connectivity, steering mounted audio and Bluetooth controls.